Mormon Mommy Writers and Friends: Do You Still Find Time to Write? Last Saturday evening I went to a Seminary training meeting. As these things invariably are, it was helpful and encouraging and the biscuits were excellent. Afterwards, just in passing, the Seminary director asked, "Do you still find time to write?" It was nice of him to ask, especially since I didn't know that he knew I was an author. Seminary is a pretty time-hungry calling, so it was a valid question. I have three children, a job, a home to care for, and I spend at least two hours a day on my seminary calling and an hour a day at the gym. But the answer was "Yes", I do still find time to write. In fact, over the last month I've written an average of a thousand words a day. My secret is my little notebook computer, which fits in my handbag. On Tuesday evenings I drive my children to the chapel for their mutual activity, and since it's not worth driving all the way home again just to come back half-an-hour later, I hang out in an empty classroom and write. On Thursday evenings I take my middle daughter to ballet, and while I wait outside the studio, out comes the computer again. Around once a month I travel to London on business. The train journey only takes 45 minutes each way, but you'll be surprised how much you can get done in that time. At every opportunity, no matter how brief, I seize the chance to add a few more words to my work-in-progress. It's only by doing this that I can still find time to write despite the constant rush of everyday life. You're busy too. 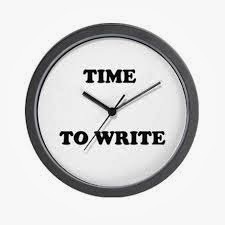 How do you carve out time to write? Nap time at my house is writing time. I'm in editing mode right now, but NaNo really opened my eyes to just how much I can get done when I use every spare minute of mkt day!